I am now in my young seventies, having been bicycling—and hiking—in Europe for some 20 years, alone, or in the company of my spouse, or with other family members and occasionally with an organized group. There is no better way to keep healthy or to enjoy the countryside of Europe! From 1985 to 2002 I owned a small apartment in Paris. 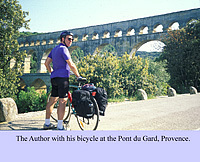 I kept two hybrid bicycles there, and using Paris as a base, I or we went off to ride one or two cycle tours a year. Now I own a small home in the south of France, and keep two bicycles there, visiting Paris only rarely. I have recently spent days and days—it is mid-February, 2012 at this writing—completely revising the cycle-touring materials I have had on the web and moving them to this new Site. Hopefully they are accurate and up to date, but if not I would appreciate hearing about it by email. I considered redoing the site as a blog, but at my age I am not into constant daily or weekly contact with others. In fact, one of my greatest pleasures in biking and hiking is to be completely out of touch, and in communion with nature or the man-made wonders in Europe that still astonish. I previously lived in New England and now live in the Pacific Northwest. Both areas have plenty of natural beauty, cullture, and opportunities for cycling and hiking. So is it necessary to go off to Europe? Of course not. But I think the experience broadens one's perspectives and enriches one's life.